We started a book sale at my library recently. There were book sales in the past, apparently, but were always one-shot deals. Those can be profitable, but they are also so much work. At this stage of things I wanted something with relatively low maintenance. So we set out three bookshelves in the area near the circulation desk, filled them with books and sundry, and we've been replenishing them as people purchase stuff. It's going well so far, although it has tapered off a bit since the first rush when it was brand new. I'm not worried since we've been strategizing about how to keep people aware of and buying from the book sale. I'm confident it will be a small but steady revenue stream for the library. The emphasis in this instance is on "small." This book sale isn't going to provide enough money to make any major purchases for our collection. At first I thought I'd use the money to add some popular appeal materials to the collection - graphic novels, Hollywood movies, etc. But then I had a moment of inspiration, thanks to a conversation I had with a student. You see, I have a weekly meeting with a liaison from our student government. She brings me concerns from the students - things like noise in the library and printing issues are typical. She also brings announcements from me back to SGA. We were talking about the book sale, and about how I was hoping to get SGA's help with picking the movies and such that I'll buy. Her response was interesting: she mentioned that students in certain majors complain sometimes about not having enough new library materials in their areas. We talked about how expensive academic library materials can be, and how little money we've earned so far. But then I realized this was a perfect opportunity for outreach/marketing, and I said: "How about we leave how I'll spend this money up to SGA?" She smiled broadly and told me she'd get back to me with SGA's response. And it's that moment that prompted me to write this post. 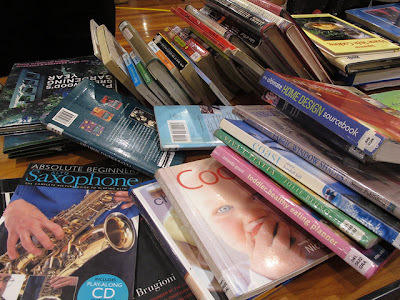 Are we going to earn a lot of money from the book sale? No. Does that mean I'm going to stop the book sale? Again, I say: no. That's why I wanted low maintenance, slow and steady. Return on investment considerations and all that. The thing is, the relationship building that resulted - and the positive PR I'm going to get with SGA - make the book sale worth the effort. Besides, everyone who purchases something from our book sale is going to get a little bit of happy from helping the library. Wins all around.